If you’ve been wondering where I have been – you HAVE been wondering, right?! – this should be a bit of an indication. I’ve been busy trying to get things together in my Etsy shop at Houseful Of Stitches and fulfilling orders from customers who are buying in spite of how bare it looks over there. Thank you all so much! Anyway, I tried my hand at the Cosmo Bag, which is on the cover of Amy Butler’s Style Stitches, this week. It’s the initial reason that I ended up picking the book up in the first place, but I was a bit too intimidated by it to attempt it first. 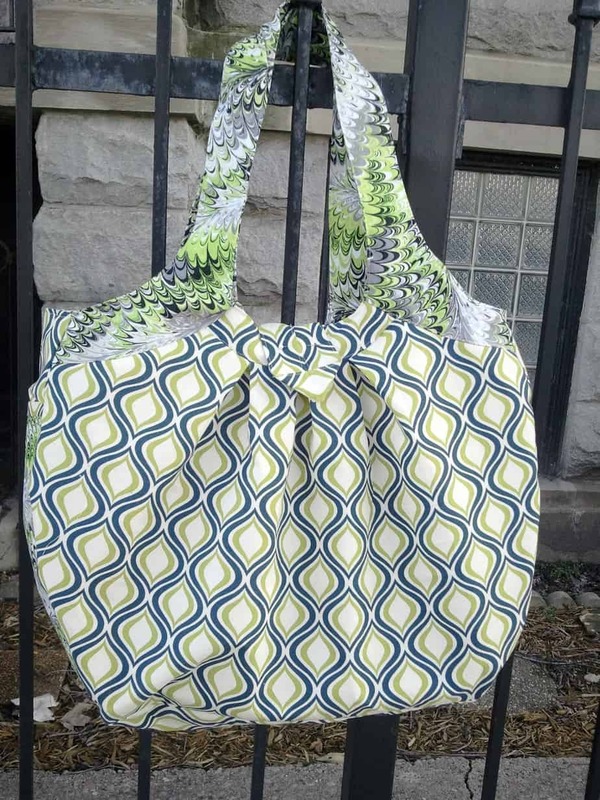 Now that I’ve sewn it, my reasoning is SO backward, and I’m a bit embarrassed to say that I probably ended up sewing the most difficult bag in the book first, and the easiest second. The only downside is the number of pieces and interfacing that is used. Amy Butler is known for not having lots of pictures to go with her sewing patterns, and for her LOVE of interfacing and attention to detail. It took a while for me to figure out how to do the button loop *hide* but I did it, and now I think that I am going to refashion how I do many button loops on other items that I make later. This bag is VERY roomy and comes with two side pockets and is supposed to have an inside pocket, but I didn’t cut one out to start. I’ll definitely be making another one for myself, and several more for customers who like it just as much as I do! And a small update on the Houseful’s collective. Mr. Houseful just celebrated his birthday this week, and the cellist is taking his ISAT tests – I hate them. The ladybug is pretty fluent with counting, her alphabet, her colors and memorizing songs of worship in a flash. And the Twizzlers. Let’s just say that they are growing into toddlerhood with such voracity that it’s not even funny. I’m attempting to get a handle on our house and it’s organization, and we’ve started researching what type of wood we’ll be using for the farmhouse table that I said we were going to build! Big things! And the weather around Chicago has been so beautiful that it’s given me a jump start to tackling these projects. This bag is SO cute!! I love it!! Thanks ma’am! I love it too. I get lots of compliments when I take it out! Good ‘head with your bad self! That bag is super cute. It’s funny to hear that you were nervous to make it because it came our fabulously!! *blushes* I’m loving it a LOT! I guess that we are our own worst critics. Let me tell you though, this interfacing of hers is NO joke! Mrs. Butler REALLY loves her interfacing. I should just buy bolts of it. I love this! Can I get one too? Of course you can, just go to the etsy shop, and convo me! Thanks for stopping by.